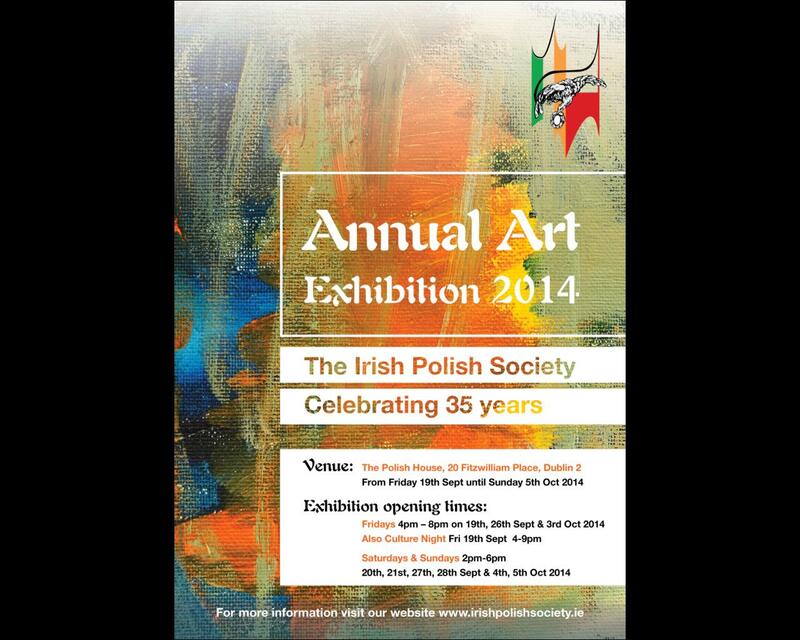 We are pleased to announce that the Irish Polish Society annual art exhibition is to take place between early October and mid November. The Irish Polish Society was founded in 1979 to promote friendship, integration and tradition, including art and culture, between the Irish and Polish communities here in Dublin This is a great opportunity to promote yourselves, the above IPS values and an opportunity to sell your art if you so wish. The exhibition will be officially opened on Monday, 12th October and will be open to the public for every Thursday, Friday and Saturday thereafter until the close of the exhibition on Saturday, 14th November. 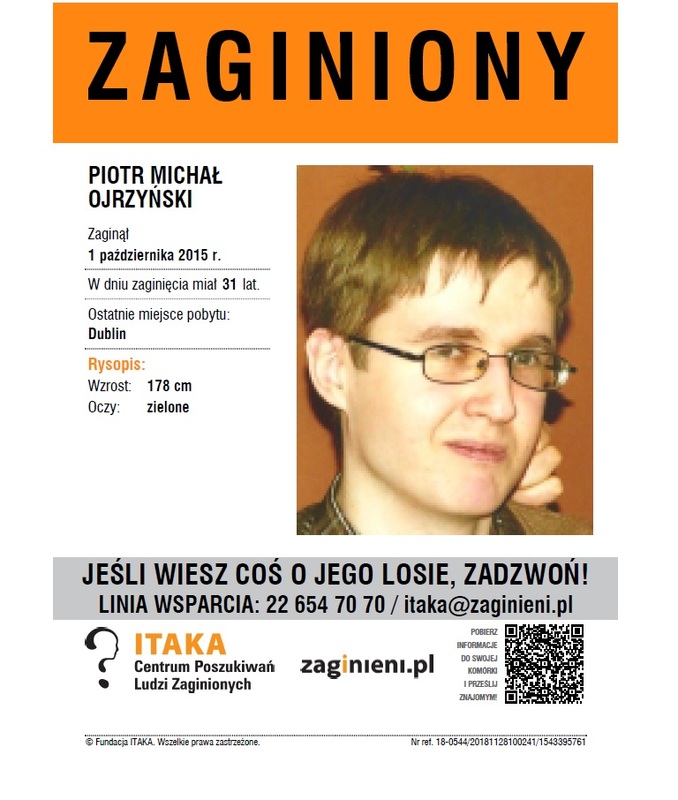 It is managed by Marysia Harasimowicz (curator) and Jason Dolan (project manager). 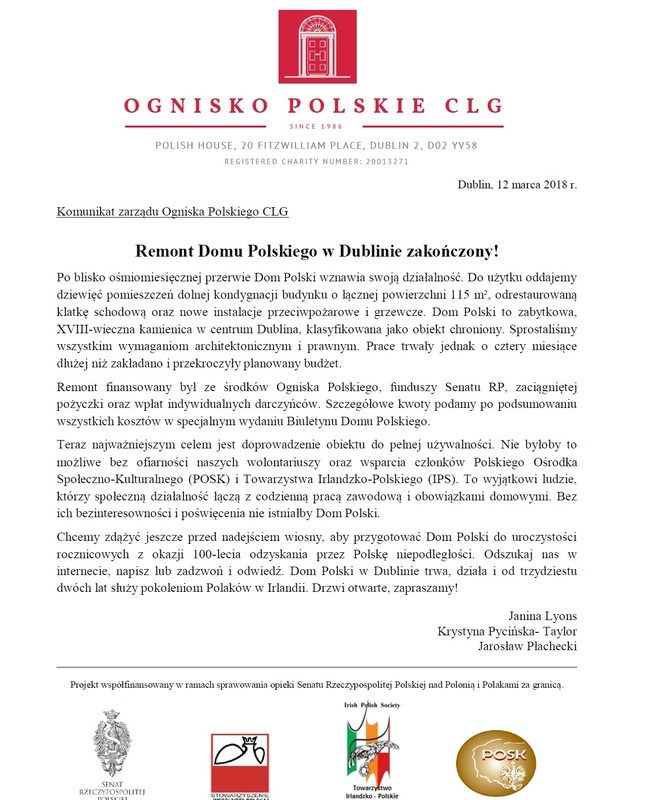 We value all comments and feedback and indeed may wish to consult with participants from time to time on myriad aspects of the exhibition and would appreciate cooperation in this regard. You must have exhibited in a past curated exhibition. 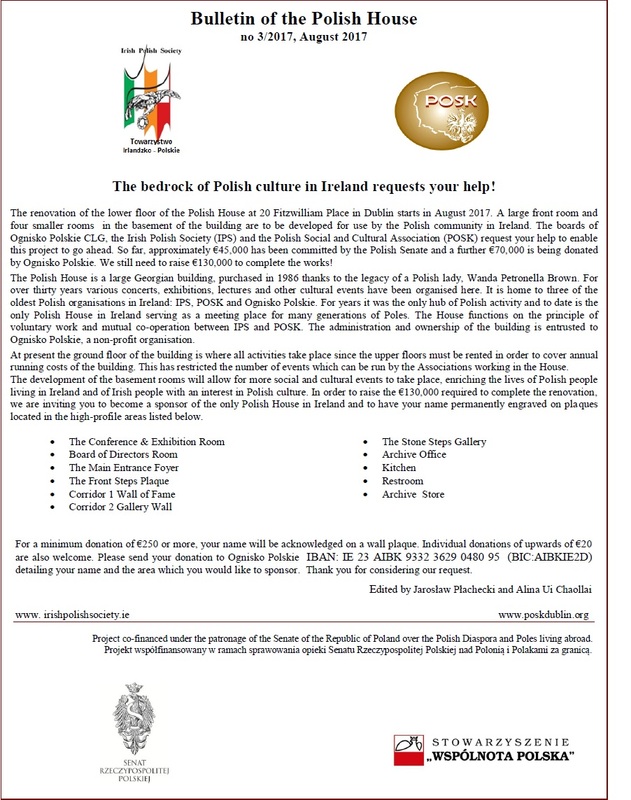 Be a current member of the Irish Polish Society – if you are not, you can still join. Only original art may be submitted which excludes digitally manipulated works or copies of existing art. If you are unsure, please check with Marysia. For this exhibition, art is defined as drawings, paintings, ceramics, sculptures, mosaics and original prints. Marysia is responsible for selecting the artwork. 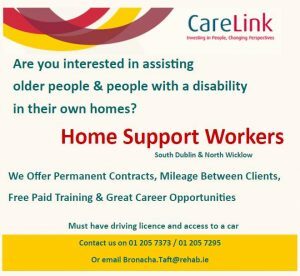 A once-off hanging fee of €15 applies per artist. For all artwork sold, the IPS will take a commission of 10% per sale. Photographs of your art must be taken for the exhibition catalogue and promotion of this event. A brief entry about yourself will be required for the art exhibition catalogue. 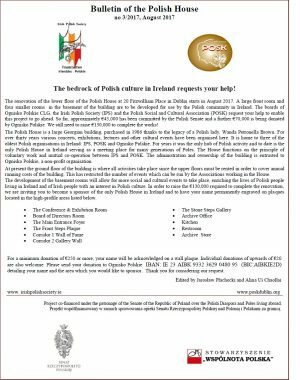 Some voluntary exhibition work is required including hanging and taking down the art, some supervision of The Polish House during the exhibition dates, help with the opening and promotion of this event and other small tasks. 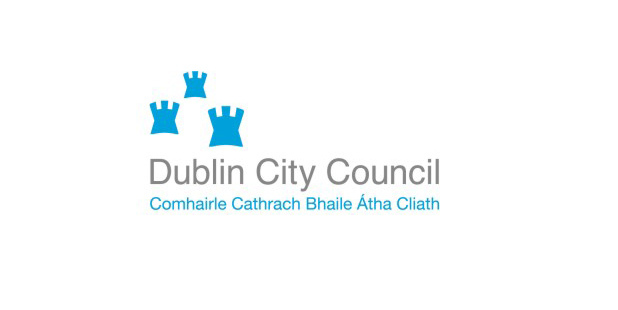 It is envisaged that the voluntary work, especially the supervision, would constitute around 8 to 10 hours over the duration of the exhibition, therefore if the artist lives outside of Dublin, then they need to be especially mindful of this. Artist curriculum vitae including past curated exhibitions of which the artist participated in and where appropriate, details of artistic related qualifications and courses. 3 samples of your work – please ensure photos are of sufficient lighting, quality and resolution to showcase your work. The file format should be JPG or PNG. Details of one or more past, curated exhibitions which you have been part of. It is important that you convey the above information to us in an email with attachments including the samples – please do not use dropbox, flickr, facebook or similar – thanks. 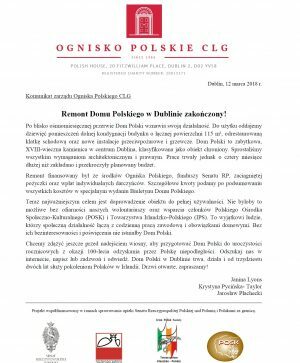 We would like to kindly remind you that in order to participate in this event, you must first be a paid member of the Irish Polish Society. If you are not a member or your membership has lapsed, please contact the IPS Treasurer Pat Quigley (patquig2002@yahoo.com). Further details will be communicated to those wishing to participate. As places are limited, we encourage you to respond early. Thank you for your time and we look forward to hearing from you soon! Marysia Harasimowicz, Curator & Jason Dolan, Project Manager.